Exoskeleton Troubles or Crown of Despair. I’ve finally stopped biting my nails (and I’ll write a detailed howto article about that in a little while). But as soon as I fixed that, I broke my one an only fake tooth. You see, one of my childhood friends was chasing me (with the intention of beating me up for something or other), and caused me to trip. I chipped my front tooth. When I was already in the US, my former half-assed dentist talked me into killing off that tooth and turning it into a crown. The result of his work was pretty sucky — the crown came out in a year or so. But by then I had a really, really good dentist replace it. And that lasted my a good while. But a few days ago I carelessly bit into a piece of chicken. There was a loud crunch and…..
Luckily my other childhood friend is a second year dental resident (yes, dentists have an option to go into residence, although it’s not required). 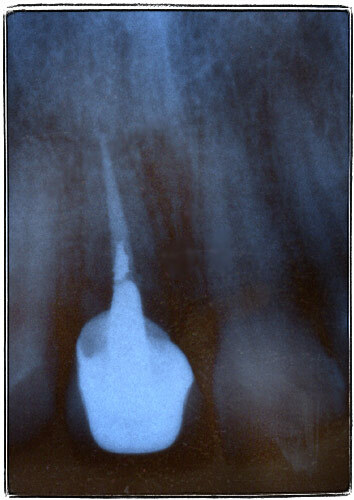 I could not get a dental appointment with my regular dentist until the 18th, but my friend took that x-ray the same day. In any case, I’ll need an implant (or a bridge, which I don’t want to do). For a couple of months I’ll have to wear a temporary replacement called a “flipper”. I know, har-har, flipper. But at least the implant is cool. An implant is basically a titanium screw that goes directly into the bone. It’s installed by either a dental surgeon or a specialist. Woohoo! Titanium! I’ll see if I can get a laser cannon, cell phone or a supercomputer mounted in there. We have the technology, right? Previous PostPrevious I Love it This Much!